Life is weird and wonderful. There is a lot of things that I've wished for or wanted throughout my life that I never got. But that was all part of growing up. We were not well-off, so we learned to except that some things we will just have to do without. Then there is the other side of the coin. Sometimes I would wish or ask for something, or would just mention that I would really like to have a certain thing and I would get it. Usually not immediately and sometimes not exactly what I had in mind and nothing mind-blowing like winning the lottery, but small everyday things that makes life easier. I have therefor come to believe that if you put something out there in the universe, it gets heard, and sometimes you get the answer you want. 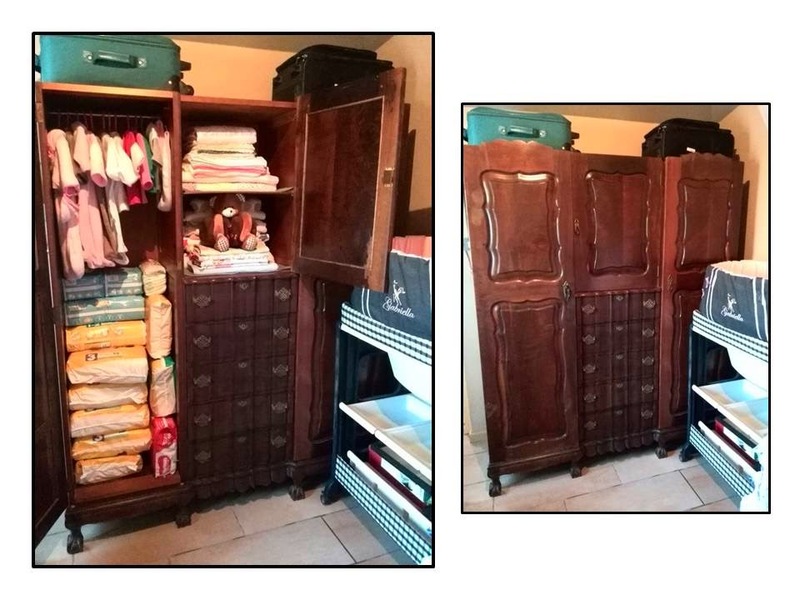 So, taking you back to a post I wrote in April, and I quote: "It has a small cloth closet which I would like to replace with a wooden one and I need to start looking for a nice chair and then it is done!" So with everything that still needed to be done, and recently the extra expenses we had with my step-dad and hubby's mum there was just not enough left over to go and look for a chair or wardrobe to buy. I thought that we just had to make do with the small cloth closet and maybe ask whether I can borrow a chair somewhere. And then the universe answered. A resident of the Home where hubby works recently passed away and when his family came to gather all his belongings they left a chair. Needles to say, it is perfect. Not fancy and new, but very comfy and perfect for the nursery. 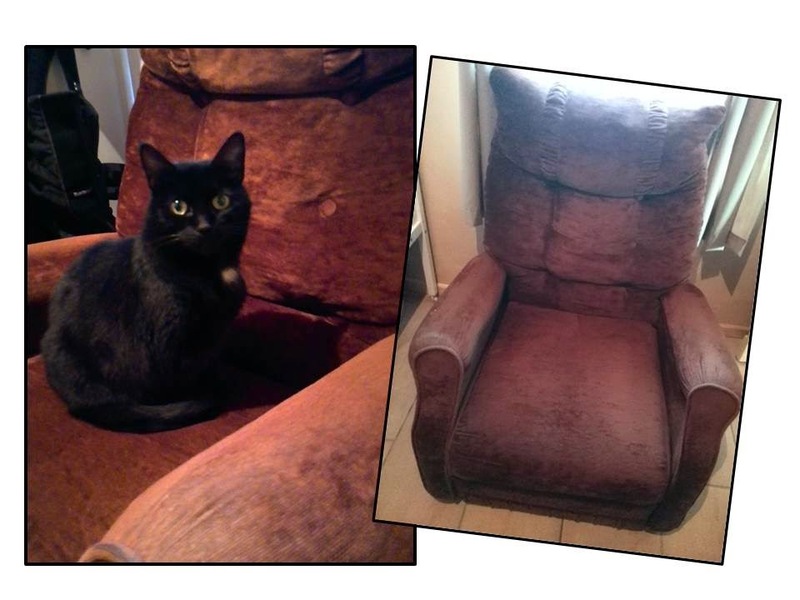 The cat tested it out and she thinks that it is great as well. And then of coarse the wardrobe. A couple of months ago - even before the discovery of the Peanut - our closet collapsed and we were urgently looking to replace it. One Saturday we went to the auction and there was the most beautiful old wardrobe. It was a 3 piece with 2 hanging sides and in the middle 2 shelves and drawers. My grandma use to own a similar wardrobe and I had my sights set on it. But seeing that it was an "antique" the price went up way beyond our budget and we lost out on it. The lady that eventually bought it was from our town, she just bought a house and this was to fit into the new house. We then bought 2 nice closets from a factory shop that was very affordable and fit perfectly into our room. About 3 weeks ago we popped into the supermarket and the lady who bought the wardrobe was there. She wanted to know whether we had come right as she had in the mean time sold her house, bough another house and the wardrobe is not fitting in anywhere. She thought that if we still wanted it, she had to give the wardrobe to us... We were speechless. We obviously know what she paid for it and now she just wanted us to have it! Of coarse we said yes, as we needed it for the nursery and wanted it very much. So last night hubby went to fetch it, I cleaned it and packed it and it is absolutely perfect. The right hand side are used for our jackets and coats which were hanging all over the nursery door. The rest are filled with all the lovely goodies we received for our little daughter. This is wonderful! How kind of the lady to give the wardrobe to you. That chair really does look comfy and will come in handy especially when you are breastfeeding, I'm sure. Remember to post a pic when the nursery is all set and ready for your little princess to arrive. I am glad everything turned out well for you! It is a reminder to me to trust God that He is timing everything out perfectly as I know I get impatient and stressed that we don't have any furniture yet!